The need to maximise space and efficiency within a kitchen is not just reserved for smaller homes. No matter how big or limited your floor space, maximising space and efficiency within your kitchen renovation should be a top priority. Making the heart of your home functional and beautiful can be challenging. The key is a combination of a cleverly designed kitchen layout, smart space planning, and precise storage solutions for everyday kitchen items and accessories. In this month’s B&C Journal we’ll show you how to make the most of the busiest and most important room in your home - the kitchen. With smart layouts and intelligent storage solutions you’ll be sure to create a kitchen design that’s not only aesthetically pleasing but functional too. If you have high ceilings, use the vertical space by building up with custom cabinetry. Maximising cabinetry height will gain you a surprise amount of storage. Using every inch of this space is important in increasing your available storage for your kitchen renovation. Plan to store infrequently used items in the cabinetry above. By building up, you will draw your eye line higher helping support the illusion of open space. Use decorative mouldings or statement light fixture to add style above your head without compromising floor space. Design Tip: Use smart overhead cabinetry hardware solution such as Blum Aventos with servo drive technology to better access items in harder to reach places like overhead kitchen cabinetry. The overall space and look of your kitchen should not be the only consideration in your kitchen design. It’s important to think about how each kitchen drawer or cabinet will be used and in doing so you can use storage solutions like custom drawer dividers within the interior of cabinets to maximise space and make them more efficient to use. Deciding where and what will be stored in each kitchen zone will also make for a more effective and efficient layout. To maximise efficiency within our kitchen design invest in clever hardware. Touch to open drawers and telescopic runners for full drawer extension will allow for maximum access and greater drawer storage - a must for any new kitchen renovation. Design Tip: Multitask your kitchen island - A kitchen island bench can often take up a large amount of floor space within the kitchen so it’s important to ensure your using it to its full potential. A kitchen island bench is not only a great place for additional storage and casual dining it can also be a place for that extra wine fridge, custom open display shelving for special decor items, or even a charging station. Strategic lighting will not only help create safe workspaces within your kitchen but will help enhance it’s overall look as well as add to the feeling of a bigger space. When planning a kitchen renovation you will need a minimum of ambient and task lighting - spot lighting can also assist in making a space feel more open. 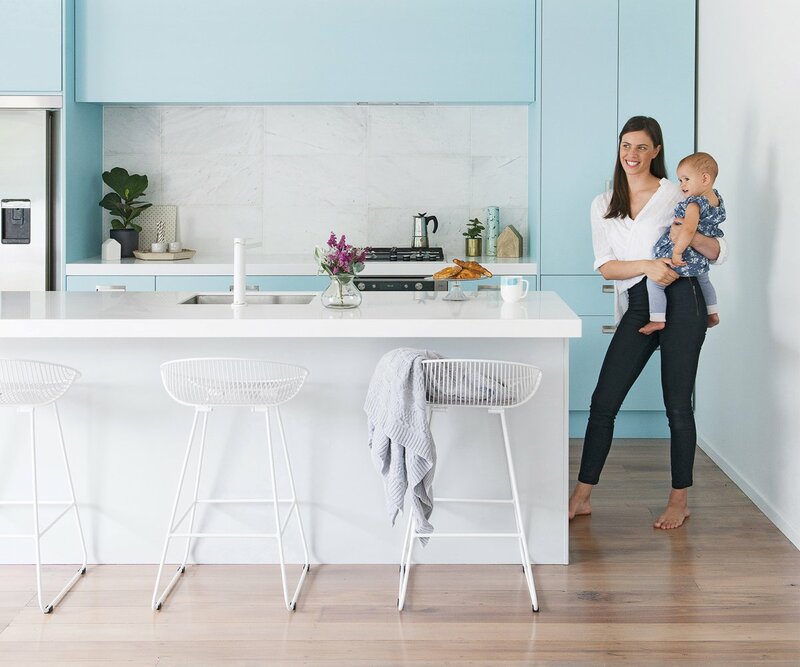 Light according to how and where you’ll complete your kitchen tasks as well as the colour of your finishes ie cabinetry, counters and walls will all affect how much light will be dispersed within the kitchen area. 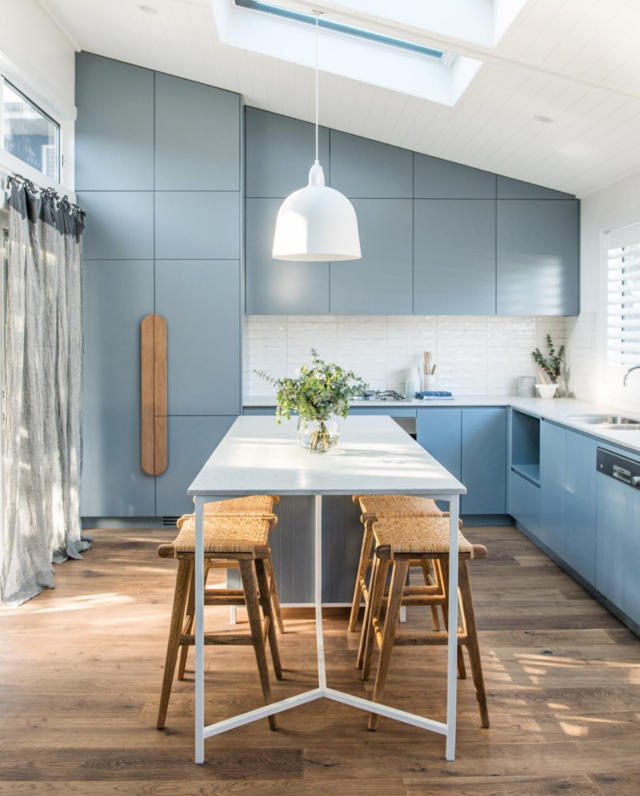 Refer to the Balnei & Colina Journal Article “How to create the best lighting scheme for your kitchen renovation” for more information on kitchen lighting. Selecting one or two dominant colours for your kitchen renovation will support the feeling of a larger space. Keeping your colour palette uncomplicated makes it easier to create a coordinated look and the provides the perfect neutral foundation for accessorising. Use different hues of the same colour to create visual interest however, avoid colour blocking with contrasting colours so that your eye sees the kitchen as one continuous structure rather than individual pieces. Design Tip: Another trick for clean lines that create the visual illusion of an open space is handless cabinetry. Your kitchen will be more organised and functional if it’s not cluttered with unused or impractical items. Before determining how much storage you’ll need for your upcoming kitchen renovation, take the time to spring clean your kitchen and clear out items you no longer use. This way, you’ll ensure your new kitchen design will only make space for the items you need and use. A great way to maximise both space and efficiency. The right decor and accessories can help amplify your kitchen space. With the right scale and used sparingly, decorative touches can not only add personality to your kitchen renovation but also visually enhance the space. Examples include art, decorative storage canisters, cutting boards and plants will create a kitchen renovation that not only reflects your personal taste but will help give an added boost to the space by drawing your eye to key focus areas within the kitchen design. 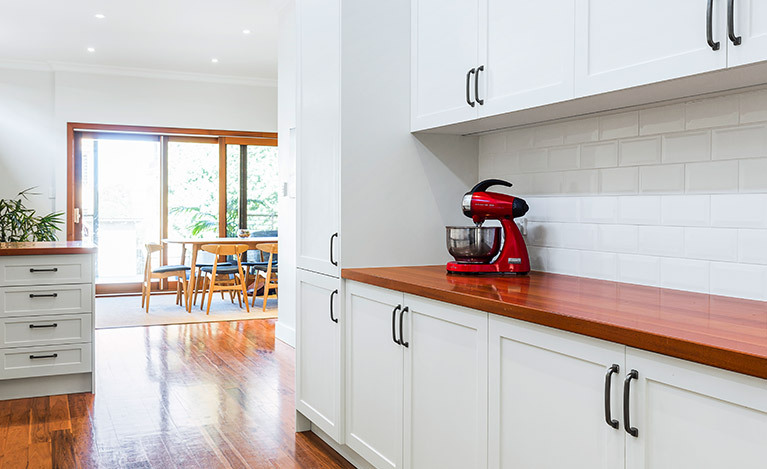 Still unsure about how to maximise space and efficiency for your next kitchen renovation? Leave it to the experts at Balnei & Colina. If you’re looking for further kitchen design inspiration and ideas, signup to our newsletter or connect with us on Instagram and Facebook to stay up to date with the latest design trends.